Max Pechstein was the son of a craftsman. He studied at the Academy of Art in Dresden and in 1906 he joined the art group Die Brücke. In 1908 he moved to Berlin where he joined the Secession. In 1911 he founded the MUIM-Institute together with Ernst Ludwig Kirchner. In the same year he married his model Lotte Kaprolat (1893-1955). He had met her in 1908 or 1909 when she worked as a model for Georg Kolbe. In 1913 they had a son, Frank. In 1914 he travelled with Lotte through Europe and then to the Palau Islands, then a German colony. The First World War cut his journey short and back in Germany he joined the army. In 1918 he founded the Novembergruppe with Erich Mendelsohn and Rolf Belling. He became a member of the Prussian Academy of Arts in 1923 and a professor in Berlin. In 1923 he divorced Lotte and he married Marta Möller (1905-1976). He travelled in France and Switzerland but in 1933 the nazis removed 326 of his works from the museums and sixteen of them were shown at the Degenerate Art exhibition. During the last years of the war he lived in Pommern. In 1945 he returned to Berlin where he became a professor once more. In 1953 he was awarded the Bundesverdinestkreuz. He died in 1955 in West Berlin. 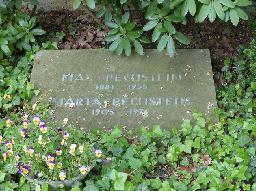 The grave of Max Pechstein at the Friedhof an der Schmargendorfer Kirche, Berlin. 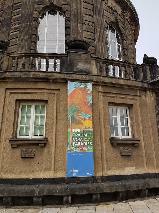 "Der Traum vom Paradies", Max Pechstein exhibition at the Stadtmuseum Zwickau.